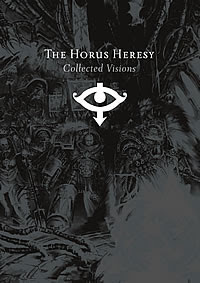 Legio Minimus: Review of "The Horus Heresy: Collected Visions"
I just finished reading the Horus Heresy: Collect vision book and it was outstanding. I was lucky enough to pick up a copy of it from the Oakville Battle bunker when I was there for the Canadian GT. For less than $70 it was a steal. It is cover to cover outstanding artwork, detailing loads of pre-heresy units and organizations all the way up to the Emperor being encased in the Golden Throne. In addition to all the art it gives a detailed account of what happened during the heresy. All of the history ties into the Horus Heresy series of novels being put out by the Black Library. If you enjoy 40k and are interested in learning more about the history of the Imperium or are simple looking for great modeling ideas, I highly recommend this book. It has also given me the inspiration to turn my Grey Knights into a Legio Custodians army.